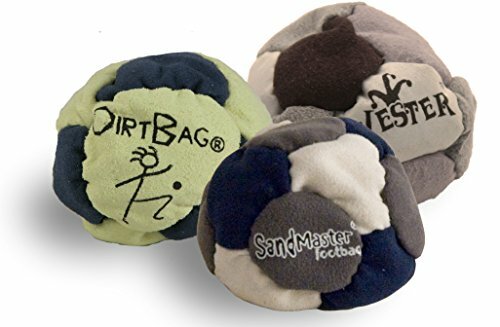 Sandmaster: A succulent 14-panel footbag (hacky sack) made of a super soft and tough synthetic suede, and filled with sand. The new and improved outer cover material, tighter stitching and unique corner closures increase its durability and sand retention. The SandMaster® footbag's 14-panels insure this model will stay extremely round for consistent kicks combined with the stickiest of stalls. **This footbag comes with the World Footbag Association's highest recommendation** "It takes a kicking, and keeps on sticking"! Dirtbag: One of the most popular footbags manufactured by the World Footbag, the undisputed industry leader. The Dirtbag footbag (hacky sack) is an eight-panel synthetic suede beauty filled with grains of sand from mother earth! Its softness, durability, and weight make this one of our best selling footbags. Jester: This 12 Panel Footbag is a multi-paneled, professional grade footbag made with the highest quality. They are very loosely filled with sand for maximum playability for doing footbag tricks. Durable imitation suede with a wide variety of panel colors. Sold as a set of three in assorted colors. May vary from image. If you have any questions about this product by The Wright Life, contact us by completing and submitting the form below. If you are looking for a specif part number, please include it with your message.